A solid headset for a reasonable price. Corsair’s HS50 Headset is a solid all-rounder at a good price. Over the last few years Corsair has changed quite dramatically. The premium manufacturer, bringing the high end to its customers has diversified outwards with an ever-growing PC gaming market, and rightly so. As a company it needs to stay relevant and current. And if that means moving towards more affordable, RGB-lit products, then logically, that’s what it needs to do. Yet in some ways it’s a change that has made me sad. After all, the glimmer of the Dominator Platinums, the legendary looks of its Obsidian line-up of chassis, and the true-genius stylings behind the original K70 were something to be admired. Today, we’re greeted with a cornucopia of plastics and soft-touch finishes, RGB lights, and a more affordable arsenal designed to appeal to a wider audience. Of course they still tout that Corsair reliability, but without the associated premium nature of those once-fabled materials. What the hell does that have to do with this headset? Well, the HS50 Stereo feels almost like an echo of that revered design style that we once knew. It’s an affordable yet stunning peripheral, with a sense of quality about it that we haven’t seen in some time. The faux leather headband, with stitching painstakingly etched into its design, the smooth metal brackets holding the memory-foam ear cups in place, and the overall feel and finish is second to none. It’s got a sensibility about it, and is just as at home on the desk of a professional videographer as much as it is on a gaming rig. In fact, it has earned a spot among the best gaming headsets you can buy. It’s versatile, too. Being analog in design, there’s no compatibility issues with laptops or any rig. On top of that, take off the removable mic and it’s instantly a solid travel companion as well. In a world obsessed with RGB, having a headset that can look just as good gaming as it does on your adventures is a huge boon, and one I feel shouldn’t be overlooked. But let’s face it: all the good looks in the world don’t make up for poor sound quality. Fortunately, Corsair seems to have hit the nail on the head here too. I'm not saying these are audiophile-grade drivers—not by a long shot—but for the money they’re definitely not bad. The largest competition around at this price point comes in from Kingston’s now legendary HyperX Cloud headset. Originally a design taken from QPad’s QH-90 headsets, the biggest advantage that Kingston’s ear huggers have is the fact they come packing a far wider frequency response (at 15 Hz-25 KHz) than Corsair’s HS50. Now your typical human, can usually only hear from 20 Hz-20 KHz, which tends to mean most manufacturers, aim for that as the sweet spot when designing their audio drivers on a budget. The problem with this is that sound itself resonates above and beyond those frequencies. By reducing the frequency of which your driver operates (which coincidentally saves cash), it has the effect of muffling the audio’s resonance, or cutting off the highest peaks and lowest lows. Think of it as comparing an MP3 audio file to a lossy FLAC file, or even an AAC. Typically speaking, the higher the range of frequency, combined with less distortion, the better quality the sound will be regardless of what audio you pump through it. The HS50 comes in at that bog standard 20 to 20, meaning sound isn’t as crisp as I’d like. It’s balanced, bass is prominent, but not too overpowering, and overall the soundscape is almost bordering on a reference feel, which is a credit to Corsair’s design team, but I feel that they could have gone further with the spec, even if it meant increasing the price by $5, it’s something I’d be happy with. Ultimately, Corsair’s HS50 headset is a nice return to form, for a company we’d feared had gone far too deep down into that rabbit hole of RGB illuminated fun times. 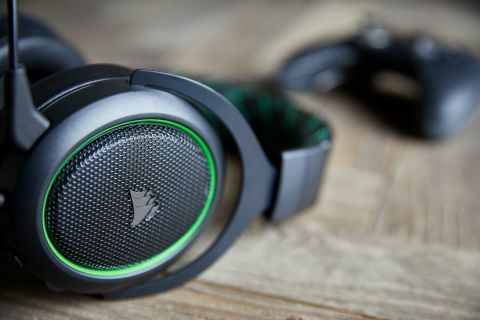 The materials used, the versatility, and the well-rounded audio make it a strong contender for any looking to buy a seriously smooth gaming headset that you can use in any environment. The audio quality isn’t quite on par with Kingston’s Clouds just yet, but it’s a step right in the direction, and if it’s any inclination of where Corsair’s peripherals are going in the future, consider us on board.